The Pemko S88W is a Fire/Smoke Gasketing. Pemko's SiliconSeal adhesive-backed fire/smoke gasketi..
270A Pemko Threshold - 1/4" x 4"
The Pemko 270A is a 1/4” x 4” Mill Finish Aluminum Threshold. Pemko manufactures thresholds in s.. The Pemko 315CN is a Mill Finish Aluminum x Neoprene Seal door sweep. 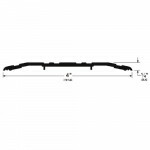 Pemko door bottom seals co.. 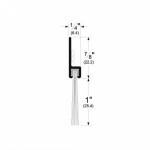 The Pemko 18100CNB is a Clear Anodized Aluminum x Nylon Brush door sweep. Pemko door bottom seal.. The Pemko S88BL is a Fire/Smoke Gasketing. 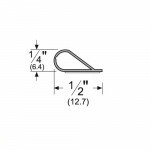 Pemko's SiliconSeal adhesive-backed fire/smoke gasket..
271A Pemko Threshold - 1/4" x 5"
The Pemko 271A is a 1/4” x 5” Mill Finish Aluminum Threshold. Pemko manufactures thresholds in s..
2005AV Pemko Threshold - 1/2" x 5"
The Pemko 2005AV is a 1/2” x 5” Mill Finish Aluminum Threshold. 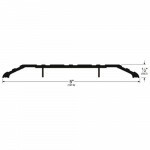 Pemko manufactures thresholds in.. The Pemko PK55W is a PemkoPrene Gasketing. 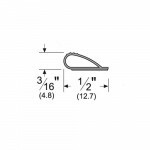 PemkoPrene Adhesive Perimeter Gasketing, Fire/Smoke S.. 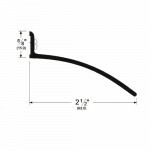 The Pemko 315DN is a Dark Bronze Anodized Aluminum x Neoprene Seal door sweep. Pemko door bottom..
172A Pemko Threshold - 1/2" x 6"
The Pemko 172A is a 1/2” x 6” Mill Finish Aluminum Threshold. Pemko manufactures thresholds in s.. 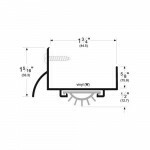 The Pemko 346C is an Overhead Rain Drip, Clear Anodized Aluminum door seal. 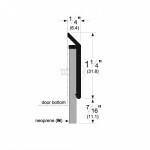 Pemko door WIDTH..
171A Pemko Threshold - 1/2" x 5"
The Pemko 171A is a 1/2” x 5” Mill Finish Aluminum Threshold. Pemko manufactures thresholds in s.. 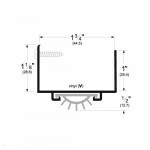 The Pemko 216DV is a Dark Bronze Anodized Aluminum x Vinyl Seal door shoe. Pemko door bottom sea.. The Pemko 217AV is a Mill finish Aluminum x Vinyl Seal door shoe. 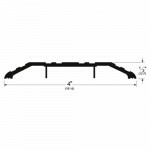 Pemko door bottom seals consis.. 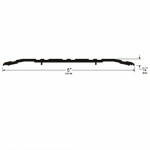 The Pemko 345DV is a Dark Bronze Anodized Aluminum x Vinyl Seal door sweep. Pemko door bottom se.. 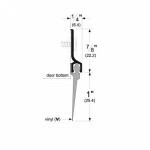 The Pemko 307DV is a Dark Bronze Anodized Aluminum x Vinyl Seal door sweep. 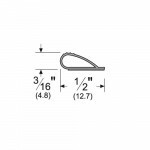 Pemko door bottom se..
170A Pemko Threshold - 1/2" x 4"
The Pemko 170A is a 1/2” x 4” Mill Finish Aluminum Threshold. Pemko manufactures thresholds in s.. The Pemko PK55BL is a PemkoPrene Gasketing. PemkoPrene Adhesive Perimeter Gasketing, Fire/Smoke .. 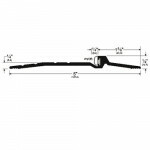 The Pemko 18100DNB is a Dark Bronze Anodized Aluminum x Nylon Brush door sweep. Pemko door botto.. 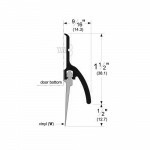 The Pemko 345AV is a Mill Finish Aluminum x Vinyl Seal door sweep. Pemko door bottom seals consi..